"...Here, in each coffin over which we bend, there is a face which stares at us--or else closes its eyes in order that it may not see us...And each royal mummy that our lantern lights reserves for us a fresh surprise and the shudder of a different fear..." The Flickr video above gives us a glimpse of the Royal Mummy Room at the Egyptian Museum as it appears today, a century after Pierre Loti's visit as recounted below. There are two of us, and as we light our way by the aid of a lantern through these vast halls we might be taken for a night watch on its round. We have just shut behind us and doubly locked the door by which we entered, and we know that we are alone, rigorously alone, although this place is so vast, with its endless, communicating halls, its high vestibules and great flights of stairs; mathematically alone, one might almost say, for this palace that we are in is one quite out of the ordinary, and all its outlets were closed and sealed at nightfall. Every night indeed the doors are sealed, on account of the priceless relics that are collected here. So we shall not meet with any living being in these halls to-night, in spite of their vast extent and endless turnings, and in spite too of all these mysterious things that are ranged on every side and fill the place with shadows and hiding places. Our round takes us first along the ground floor over flagstones that resound to our foot-steps. Here and there through some stray window gleams a small patch of luminous blue twilight, lit by the stars which for the good folk outside lend transparency to the night; but here, none the less, the place is filled with a solemn gloom, and we lower our voices, remembering perhaps the dead that fill the glass cases in the halls above. And these things which line the walls on either side of us as we pass also seem to be in the nature of receptacles for the dead. For the most part, they are sarcophagi of granite, proud and indestructible: some of them, in the shape of gigantic boxes, are laid out in line on pedestals; others, in the form of mummies, stand upright against the walls and display enormous faces, surmounted by equally enormous head-dresses. Assembled there they look like a lot of malformed giants, with oversized heads sunk curiously in their shoulders. There are, besides, some that are merely statues, colossal figures that have never held a corpse in their interiors; these all wear a strange, scarcely perceptible smile; in their huge sphinxlike headgear they reach nearly to the ceiling and their set stare passes high above our heads. And there are others that are not larger than ourselves, some even quite little, with the stature of gnomes. And, every now and then, at some sudden turning, we encounter a pair of eyes of enamel, wide-open eyes, that pierce straight into the depths of ours, that seem to follow us as we pass and make us shiver as if by the contact of a thought that comes from the abysm of the ages. We pass on rapidly, however, and somewhat inattentively, for our business here to-night is not with these simulacra on the ground floor, but with the more redoubtable hosts above. Besides, our lantern sheds so little light in these great halls that all these people of granite and sandstone and marble appear only at the precise moment of our passage, appear only to disappear, and, spreading their fantastic shadows on the walls, mingle the next moment with the great mute crowd, that grows ever more numerous behind us. Placed at intervals are apparatus for use in case of fire, coils of hose and standpipes that shine with the warm glow of burnished copper, and I ask my companion of the watch: "What is there that could burn here? Are not these good people all of stone?" And he answers: "Not here indeed; but consider how the things that are above would blaze." Ah! yes. The "things that are above"--which are indeed the object of my visit tonight. I had no thought of fire catching hold in an assembly of mummies; of the old withered flesh, the dead, dry hair, the venerable carcasses of kings and queens, soaked as they are in natron and oils, crackling like so many boxes of matches. It is chiefly on account of this danger indeed that the seals are put upon the doors at nightfall, and that it needs a special favour to be allowed to penetrate into this place at night with a lantern. In the daytime this "Museum of Egyptian Antiquities" is as vulgar a thing as you can conceive, filled though it is with priceless treasures. It is the most pompous, the most outrageous of those buildings, of no style at all, by which each year the New Cairo is enriched; open to all who care to gaze at close quarters, in a light that is almost brutal, upon these august dead, who fondly thought that they had hidden themselves forever. But at night!...Ah! At night when all the doors are closed, it is the palace of nightmare and of fear. At night, so say the Arab guardians, who would not enter it at the price of gold--no, not even after offering up a prayer--at night, horrible "forms" escape, not only from the embalmed bodies that sleep in the glass cases above, but also from the great statues, from the papyri, and the thousand and one things that, at the bottom of the tombs, have long been impregnated with human essence. And these "forms" are like unto dead bodies, and sometimes to strange beasts, even to beasts that crawl. We next ascend a staircase of monumental proportions, empty in its whole extent, where we are delivered for a little while from the obsession of those rigid figures, from the stares and smiles of the good people in white stone and black granite who throng the galleries and vestibules on the ground floor. None of them, to be sure, will follow us; but all the same they guard in force and perplex with their shadows the only way by which we can retreat, if the formidable hosts above have in store for us too sinister a welcome. He to whose courtesy I owe the relaxation of the orders of the night is the illustrious savant to whose care has been entrusted the direction of the excavations in Egyptian soil; he is also the comptroller of this vast museum, and it is he himself who has kindly consented to act as my guide to-night through its mazy labyrinth. Across the silent halls above we now proceed straight towards those of whom I have demanded this nocturnal audience. Tonight the succession of these rooms, filled with glass cases, which cover more than four hundred yards along the four sides of the building, seems to be without end. After passing, in turn, the papyri, the enamels, the vases that contain human entrails, we reach the mummies of the sacred beasts: cats, ibises, dogs, hawks, all with their mummy cloths and sarcophagi; and monkeys, too, that remain grotesque even in death. Then commence the human masks, and, upright in glass fronted cupboards, the mummy cases in which the body, swathed in its mummy cloths, was moulded, and which reproduced, more or less enlarged, the figure of the deceased. Quite a lot of courtesans of the Greco-Roman epoch, moulded in paste in this wise after death and crowned with roses, smile at us provokingly from behind their windows. Masks of the colour of dead flesh alternate with others of gold which gleam as the light of our lantern plays upon them momentarily in our rapid passage. Their eyes are always too large, the eyelids too wide open and the dilated pupils seem to stare at us with alarm. Amongst these mummy cases and these coffin lids fashioned in the shape of the human figure, there are some that seem to have been made for giants; the head especially, beneath its cumbrous head-dress, the head stuffed as it were between the hunch-back shoulders, looks enormous, out of all proportion to the body which, towards the feet, narrows like a scabbard. On a table in the middle of one of these rooms a thing to make you shudder gleams in a glass box, a fragile thing that failed of life some two thousand years ago. It is the mummy of a human embryo, and someone, to appease the malice of this born-dead thing, had covered its face with a coating of gold--for, according to the belief of the Egyptians, these little abortions became the evil genii of their families if proper honour was not paid to them. At the end of its negligible body, the gilded head, with its great foetus eyes, is unforgettable for its suffering ugliness, for its frustrated and ferocious expression. In the halls into which we next penetrate there are veritable dead bodies ranged on either side of us as we pass; their coffins are displayed in tiers one above the other; the air is heavy with the sickly odour of mummies; and on the ground, curled always like some huge serpent, the leather hoses are in readiness, for here indeed is the danger spot for fire. And the master of this strange house whispers to me: "This is the place. Look! There they are." In truth I recognize the place, having often come here in the daytime, like other people. In spite of the darkness, which commences at some ten paces from us--so small is the circle of light cast by our lantern--I can distinguish the double row of the great royal coffins, open without shame in their glass cases. And standing against the walls, upright, like so many sentinels, are the coffin lids, fashioned in the shape of the human figure. We are there at last, admitted at this unseasonable hour into the guest chamber of kings and queens, for an audience that is private indeed. And there, first of all, is the woman with the baby, upon whom, without stopping, we throw the light of our lantern. A woman who died in giving to the world a little dead prince. Since the old embalmers no one has seen the face of this Queen Makeri. In her coffin there she is simply a tall female figure, outlined beneath the close-bound swathings of brown-coloured bandages. At her feet lies the fatal baby, grotesquely shrivelled, and veiled and mysterious as the mother herself; a sort of doll, it seems, put there to keep her eternal company in the slow passing of endless years. More fearsome to approach is the row of unswathed mummies that follow. Here, in each coffin over which we bend, there is a face which stares at us--or else closes its eyes in order that it may not see us; and meager shoulders and lean arms, and hands with overgrown nails that protrude from miserable rags. And each royal mummy that our lantern lights reserves for us a fresh surprise and the shudder of a different fear--they resemble one another so little. Some of them seem to laugh, showing their yellow teeth; others have an expression of infinite sadness and suffering. Sometimes the faces are small, refined and still beautiful despite the pinching of the nostrils; sometimes they are excessively enlarged by putrid swelling, with the tip of the nose eaten away. The embalmers, we know, were not sure of their means, and the mummies were not always a success. In some cases putrefaction ensued, and corruption and even sudden hatchings of larvae, "companions without ears and without eyes," which died indeed in time but only after they had perforated all the flesh. Hard by are ranked according to dynasty, and in chronological order, the proud Pharaohs in a piteous row: father, son, grandson, great-grandson. And common paper tickets tell their tremendous names, Seti I, Ramesses II, Seti II, Ramesses III, Ramesses IV....Soon the muster will be complete, with such energy have men dug in the heart of the rocks to find them all; and these glass cases will no doubt be their final resting-place. In olden days, however, they made many pilgrimages after death, for in the troubled times of the history of Egypt it was one of the harassing preoccupations of the reigning sovereign to hide, to hide at all costs, the mummies of his ancestors, which filled the earth increasingly, and which the violators of tombs were so swift to track. Then they were carried clandestinely from one grave to another, raised each from his own pompous sepulcher, to be buried at last together in some humble and less conspicuous vault. But it is here, in this museum of Egyptian antiquities, that they are about to accomplish their return to dust, which has been deferred, as if by miracle, for so many centuries. Now, stripped of their bandages, their days are numbered, and it behoves us to hasten to draw these physiognomies of three or four thousand years ago, which are about to perish. In the next coffin lies his father, Seti I., who reigned for a much shorter period, and died much younger than he. This youthfulness is apparent still in the features of the mummy, which are impressed besides with a persistent beauty. Indeed this good king Seti looks the picture of calm and serene reverie. There is nothing shocking in his dead face, with its long closed eyes, its delicate lips, its noble chin and unblemished profile. It is soothing and pleasant even to see him sleeping there with his hands crossed upon his breast. And it seems strange, that he, who looks so young, should have for son the old man, almost a centenarian, who lies beside him. In our passage we have gazed on many other royal mummies, some tranquil and some grimacing. But, to finish, there is one of them (the third coffin there, in the row in front of us), a certain Queen Nsitanebashru, whom I approach with fear, albeit it is mainly on her account that I have ventured to make this fantastical round. Even in the daytime she attains to the maximum of horror that a spectral figure can evoke. What will she be like tonight in the uncertain light of our little lantern? There she is indeed, the disheveled vampire, in her place right enough, stretched at full length, but looking always as if she were about to leap up; and straightaway I meet the sidelong glance of her enameled pupils, shining out of half closed eyelids, with lashes that are still almost perfect. Oh! The terrifying person! 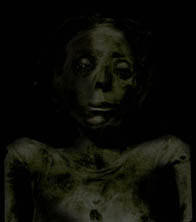 Not that she is ugly, on the contrary we can see that she was rather pretty and was mummied young. What distinguishes her from the others is her air of thwarted anger, of fury, as it were, at being dead. The embalmers have colored her very religiously, but the pink, under the action of the salts of the skin, has become decomposed here and there and given place to a number of green spots. Her naked shoulders, the height of the arms above the rags which were once her splendid shroud, have still a certain sleek roundness, but they, too, are stained with greenish and black splotches, such as may be seen on the skins of snakes. Assuredly no corpse, either here or elsewhere, has ever preserved such an expression of intense life, of ironical, implacable ferocity. Her mouth is twisted in a little smile of defiance; her nostrils pinched like those of a ghoul on the scent of blood, and her eyes seem to say to each one who approaches: "Yes, I am laid in my coffin; but you will very soon see I can get out of it." There is something confusing in the thought that the menace of this terrible expression, and this appearance of ill-restrained ferocity had endured for some hundreds of years before the commencement of our era, and endured to no purpose in the secret darkness of a closed coffin at the bottom of some doorless vault. As I traverse the obscurity of these endless halls, a vague instinct of self preservation induces me to turn back again, and look behind. And it seems to me that already the woman with the baby is slowly raising herself, with a thousand precautions and stratagems, her head still completely covered. While farther down, that disheveled hair....Oh! I can see her well, sitting up with a sudden jerk, the ghoul with the enamel eyes, the lady Nsitanebashru! in the flickering light of Loti's lamp. Then see Rousseau's portrait of Pierre Loti. Photo Credits: All images on this page have been heavily retouched and altered using Adobe Photo Deluxe. Sources for original photos are as follows: Awibre-Hor's Ka Statue from Ottar Vendel's Egyptian History website; Maatkare Coffin from Ikram and Dodson, MiAE, 230; Ramesses III Mummy from G. E. Smith, RM, pl. L; Ramesses II Mummy and Seti I Mummy from Gaston Maspero, MR; Gaston Maspero, MR; and G. E. Smith, RM, pl. XXXII; Nestanebetashru from G. E. Smith's RM, pl. LXXXVI. 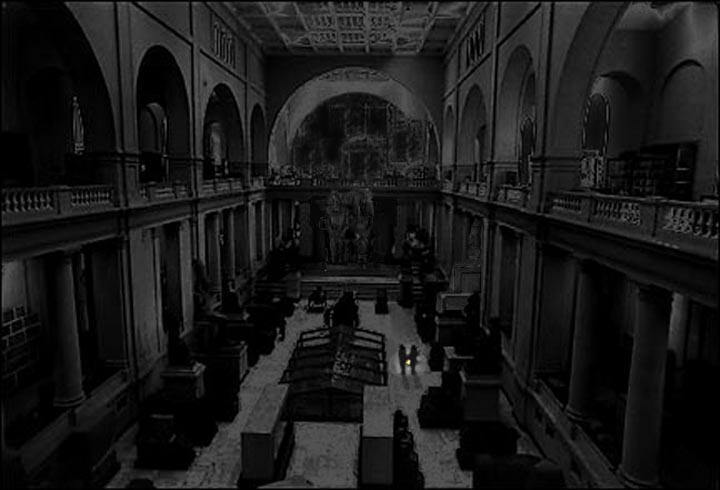 Background Photo: Cairo Museum Interior from Steven Beikirch, My Recent Trip To Egypt. the mummies seen by Pierre Loti!